Nigerian rising music act, Vincent is back with visuals to his single ‘Your Body’ featuring DMW finest, Mayorkun. Directed by Unlimited LA. The video to "Your Body" was shot on location in Lagos, Nigeria. The WMG Entertainment signee, Vincent born Ezemegbu Vincent Ifeanyi is a Student of Babcock University, Nigeria. 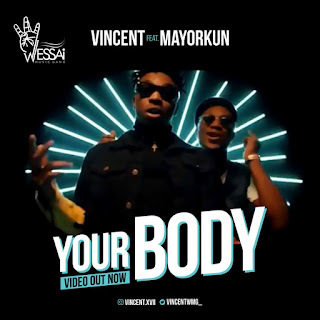 He's an AfroPop and RnB sensation with a lot of Promises and get the help of Mayorkun on “Your Body” a song produced by HitMaker Kiddominat. Watch the visuals to Your Body, enjoy and share.